Who doesn't wish they were in the Beatles? 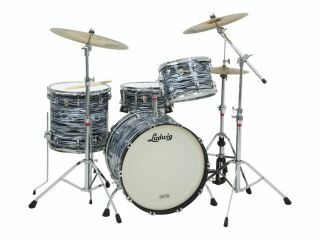 Ludwig's new Fab 4 Accent Series kit will make you feel like you are. Or were. You get the idea. By the late Sixties, from the Let It Be sessions onward, Ringo Starr was using a 22" x 14" kick drum, which is what we've got here on Ludwig's beautiful new LR1024EC, meticulously crafted to today's standards with improved 800 Series hardware. The set also includes a 16" x 16" floor tom, 13" x 9" tom, and a 14" x 6.5" wood snare. Drum shells are made of 7-ply maple. The kit comes with the Mini-Classic Lugs, and there is an option for changing them to Classic or Long Lugs. Drum heads are Ludwig Medium-coated white. As earlier stated, the hardware is Ludwig's sturdy, double-braced 800 Series -- much better that the original gear used during the time of the Rooftop Sessions. The hardware is as follows:: a LM822SSL snare stand, LM826CS cymbal stand, LM836MBS boom stand, and LM817HH hi-hat stand. The kick drum pedal is Ludwig popular L201, also known as the Speed King. The kick drum comes with the Classic 1308 spurs that slide inside when you are transporting or moving the kit. With over 24 finishes to choose from, there's bound to be one to match your impressive ring collection. List price is $3,713.00 US.